If you want to get the results a restaurant gets you need to use the ingredients they do. Demi-glace is one of those ingredients. It’s a flavour bomb. Pan-frying steaks? Slip a bit in to take the sauce over the top. Prime rib roast dinner? A bit of demi-glace is killer. Roasting a chicken? Drizzle a bit onto the plate after you pour the jus. It’s one of those truly great ingredients. Traditional demi-glace is serious, serious business. This recipe is demanding but the real thing – that’s a labour of love. The famous French chef Auguste Escoffier captures it in his Guide to Modern Cookery (Le Guide Culinaire). That book is over 100 years old and still there’s not a better version of this sauce. His version goes like this. Roast off veal bones. Simmer for about 12-16 hours to make brown stock. 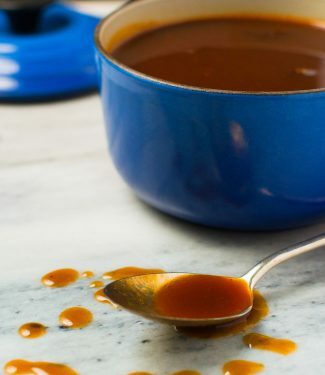 Take some of the brown stock and reduce it until you literally have a glaze. Take more of it and make a sauce espagnole. That takes 4 or 5 hours. Then combine still more brown stock, the veal glaze, the sauce espagnole and some Madeira wine and reduce that to about 2 cups. 2 cups of nuclear powered flavour. Blow your mind flavour. I’ve done it a few times. My way isn’t as good – nothing comes for free – but it’s reasonably close and it’s way easier. Roast some veal bones and aromatics. Add some tomato paste, cover with water and simmer for about a day. You can walk away while this happens. Check it every now and then to add a bit of water. Skim it as needed. You can sleep while this happens. It’s not hard. Just takes time. Remove the bones and strain. Cool it down. Skim any fat and then reduce. And reduce. Down to a few cups. Freeze it in an ice cube tray. Now you have flavour bombs ready to fire. Might not be quite as good as Escoffier’s version. 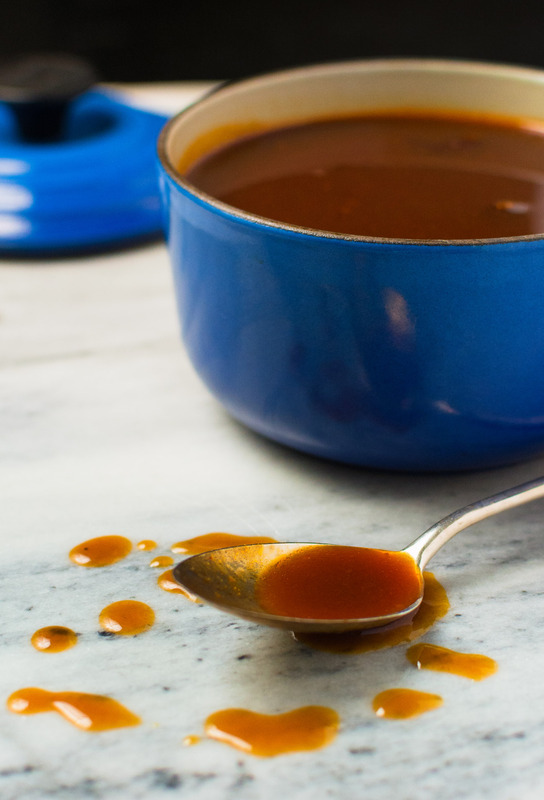 But maybe you’ll actually make this demi-glace. 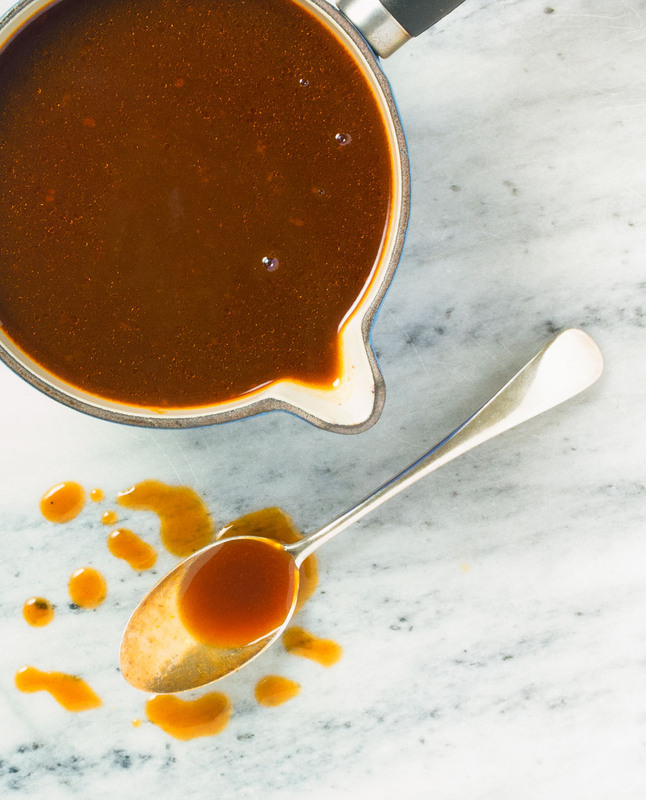 Demi-glace is one of the restaurant's secret weapons. Virtually all high-end restaurants use it. Now you can too. Heat your oven to 375F. Spread the bones in an even layer on a sturdy baking sheet and roast for 90 minutes. Make sure your baking sheet has sides at least 3/4" high as the bones will throw a lot of fat. Remove fat and sprinkle the carrots, onions, shallots and leeks overtop. Roast another 30 minutes or so. Place bones and aromatics in a large stock pot, add the tomato paste and thyme and simmer gently (I mean gently) for around 18-24 hours. Remove from heat. Let cool slightly, remove bones and strain through a fine strainer. Let cool completely. Skim any surface fat. Return to a pot and simmer gently to a final volume of 2-3 cups. Portion demi-glace in an ice cube tray and freeze. Place cubes in a zip loc bag or better yet vacuum pack 3 or 4 cubes per package. Use on your unsuspecting guests to amaze them. In beef, french, sides and stuff. Bookmark the permalink. Demi-glace yes! So delicious, so flavorful, and SO important in the culinary world. The best part? It’s not just for restaurant chefs anymore. Thanks, Romain! My pleasure. Demi-glace is really wonderful stuff and it has set higher end restaurants apart for many years. There’s no reason why you can’t do it though. This sounds like a great idea to quickly add over-the-top flavor after the initial investment. I’d love to have some of these flavor bombs in the freezer for days I don’t have lots of time in the kitchen. This would be a great recipe for me to make on the weekends when I have time to leisurely tinker in the kitchen, thank you! That’s what I do. It’s really mostly just sitting around waiting. No reason why it can’t be bubbling gently on the stove while you do other things. You can even stretch it over a couple days if you want. It can spend the night in the fridge. No harm, no foul. Hope you try it someday. It’s addictive. I can’t wait to try this out. I just need to find veal bones..would I be able to use beef bones or..some other meat bones in it’s place? I have never seen this done with anything but veal bones. I do a super reduced chicken stock but its just chicken bones and an onion. If you have a butcher that caters to an Italian clientele, they will have veal bones. Just came across your website…love your style of wit and how your recipes are laid out! Thanks for the demi-glace recipe…I didn’t know I needed it but it just might be what I’ve been missing in some dishes. I’ve made bone broth so I’m no stranger to the time-commitment; no doubt it will be worth it though. Vesi, that’s great to hear. I like to have some demi-glace in the freezer (in cubes) to toss into dishes that need that little extra oomph. I use a food saver to store 3-4 cubes per package to avoid freezer burn. All text and images are © 2016-2018 www.glebekitchen.com. All rights reserved.